As part of this year’s Performa Biennial in New York, Barbara Kruger is doing her first visual performance, exploring the power and role of media, and hitting back at the skate brand that appropriated her own for its logo. Kruger, known for her provocative lens on pop culture and takedown of social stereotypes, will have her work appear all over New York across the Biennial. Untitled (The Drop) is her first live performance, a pop-up shop in New York, which includes apparel and merch featuring Kruger’s work, produced by Volcom. Located in SoHo, participants will be able to queue and have a 10-minute slot to browse and purchase from the shop. The concept seems like a not-so-subtle swipe at Supreme, taking the skate brand’s box logo (which was heavily influenced by Kruger herself) and repurposing it for her own iconic phrases. “WANT IT, BUY IT, FORGET IT” clothing reads, while a skateboard is emblazoned with “DON’T BE A JERK”. 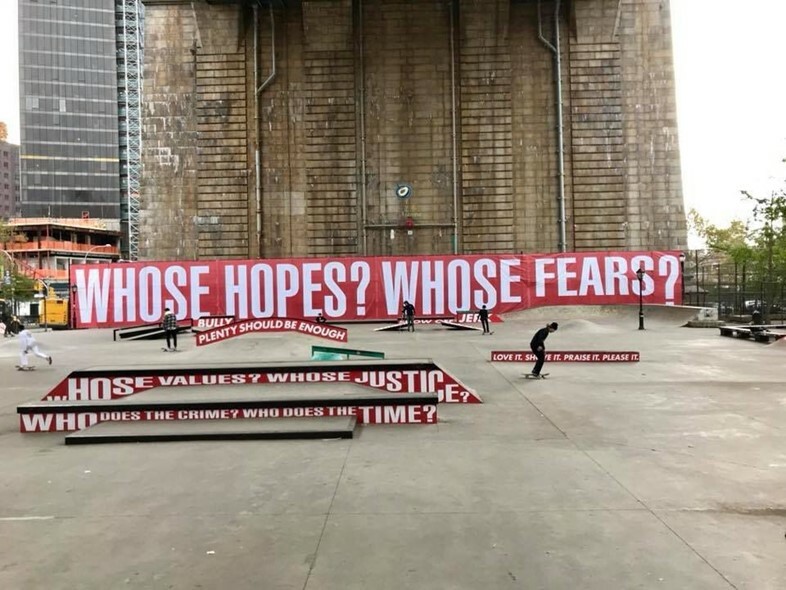 The artist has also brought her art to Coleman Skate Park in Manhattan, with ramps featuring phrases like “BE HERE NOW” and “WHO SALUTES LONGEST”, and decorated an NYC billboard and old school bus in similar fashion. She also debuted a limited edition MetroCard, with 50,000 placed in vending machines in four NY subway stations.